Special Containment Procedures: The primary sample of SCP-667-1 is to be trimmed to an area of 0.5 sq km and maintained regularly to prevent it from expanding outside its current habitat. The perimeter of SCP-667-1's habitat is to be cleared of vegetation in a 30 m radius and fenced to prevent unauthorized access, and a region within a 3 km radius of the habitat is to be designated off-limits to civilian hikers or recreationists to prevent contact with SCP-667-2. Surveillance personnel are authorized to employ pesticides or fire to neutralize any instances of SCP-667-2 attempting to exit the containment zone. During periods when SCP-667-2 is observed to be active, maintenance personnel are to withdraw from the habitat. An individual adult mammal, or an individual D-class awaiting scheduled termination, is to be introduced into the habitat after being tagged with a radio tracking or GPS device. D-class personnel may be issued audio or video equipment at project manager discretion. Feeding is to continue at a rate of one individual per day until SCP-667-2 becomes inactive. Additional samples of SCP-667-1 may be produced from cuttings and grown within prescribed limits in a fully contained area at O5 discretion. All attempts to capture a live sample of SCP-667-2 are currently prohibited pending development of a means to counteract its mind-affecting properties. Any SCP-667-2 remains recovered are to be transferred to Site 73 for necropsy, analysis, and archival. Description: SCP-667 is a symbiotic pairing consisting of a colony of flowering vines of an unclassified species morphologically similar to Pueraria lobata ("kudzu"), designated SCP-667-1, and an unclassified species of flying creatures possessing insectoid and humanoid morphological qualities, designated SCP-667-2. The only known instance of SCP-667 in the world is located in a wilderness area in the southeastern United States, approximately ██ km north of ██████████, ██, and covered an area of ██ sq km prior to being trimmed to its current size. 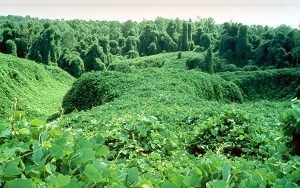 Forensic analysis of skeletal remains found within SCP-667-1 indicate that it was introduced to the region shortly after the introduction of kudzu to the United States in the late 19th century. In the presence of adequate nutrition, SCP-667-1 is capable of growing at a rate considerably greater than that of the standard kudzu plant; samples in captivity, under ideal conditions, have been observed to grow as rapidly as 2.5 meters per day. SCP-667-1 is capable of planting roots in almost any form of soil or soft organic tissue and will grow along or over the surface of any foreign matter in the path of its growth, including trees, structures, automobiles, or animal life. SCP-667-1's primary source of nutrition is derived from humans or other large mammals; upon encountering a sleeping, paralyzed, or dead animal within its path of growth, SCP-667-1 will rapidly grow around and through the creature, gradually consuming and metabolizing its remains to further its growth. SCP-667-1's vines, flowers, and roots contain large quantities of alkaline compounds which render it unpalatable to human beings and all other animal species (besides SCP-667-2) on which it has been tested. Mature SCP-667-2 organisms are approximately 7.5 cm in length, with two large wings extending the entire length of the organism. Dissections indicate that SCP-667-2's internal biology is similar to that of insects of the family Lampyridae ("fireflies"). SCP-667-2's exoskeleton strongly resembles a miniaturized human being, with the organism's thorax being contained within the chest cavity and the abdomen and bioluminescent organ concealed within the legs. Male and female SCP-667-2 organisms have been recovered; female SCP-667-2 organisms reproduce by laying eggs which hatch as larvae, burrowing into the soils underneath SCP-667-1 and emerging as mature insects the following year. The current wild population of mature SCP-667-2 organisms at any given time is estimated to be less than 5,000; as many as ██████ are believed to have existed prior to trimming. Mature SCP-667-2 organisms dwell exclusively on, underneath, and around SCP-667-1, and subsist by feeding on the nectar produced by SCP-667-1's flowers. When SCP-667-1's growth begins to slow due to deficiencies in its food supply, swarms of several hundred SCP-667-2 organisms separate from the main colony and will travel outward until encountering any medium-to-large sized mammal in the area. SCP-667-2 swarms are almost always active only during nighttime hours and are bioluminescent, producing a highly visible green glow throughout the entire organism. All human beings directly observing an SCP-667-2 swarm have described a strong hypnotic effect and a compulsion to follow the swarm, which inevitably results in the swarm leading the mesmerized human to the edge of SCP-667-1's current path of growth; non-human mammals have similarly displayed a compulsion to follow the swarm and obliviousness to outside stimuli. Upon reaching the edge of SCP-667-1, the mesmerized individual will sit or stand still and continue to observe the swarm until dying of thirst, exposure, or as the result of being engulfed by SCP-667-1. At the time of trimming, skeletal remains of approximately ██████ distinctly identifiable mammals, including ███ humans, were recovered from the cleared area. SCP-667 came to the Foundation's attention in 20██, following a dramatic increase of missing persons within the [REDACTED] Wilderness Area in the state of ██. United States Forest Service officials identified SCP-667-1 as the cause of the missing persons, and upon the loss of several personnel to SCP-667-2 swarms contacted the Foundation's liaison within the Department of Agriculture, leading to the establishment of Foundation containment over the area. At the time of discovery, SCP-667-1 had become highly invasive and its growth was projected to reach the outskirts of the city of [REDACTED] within less than a decade; approximately 9█% of SCP-667-1 was destroyed by incineration, under pretense of a forest fire, in order to reduce the colony's size to a manageable level. Examination of the region indicates that almost all of SCP-667-1's growth had occurred within the past 20 years; the Foundation's current working hypothesis is that SCP-667-2 was introduced to the region within that time, and that the development of a symbiotic relationship between itself and SCP-667-1 allowed it to begin expanding outward at a significantly greater rate than it had previously.